I have a special treat for you today! 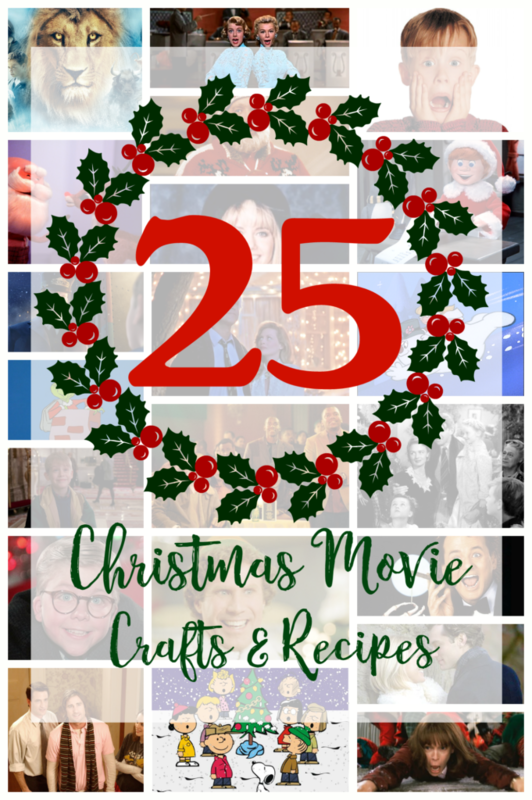 I’ve teamed up with 24 blogger friends to share 25 crafts and recipes you can make this Christmas season, all based off of some of our favorite Christmas movie classics. There are some fun craft ideas and delicious looking recipes in today’s line-up! It’s always fun to see what the other bloggers dream up when we do themed project challenges like this. 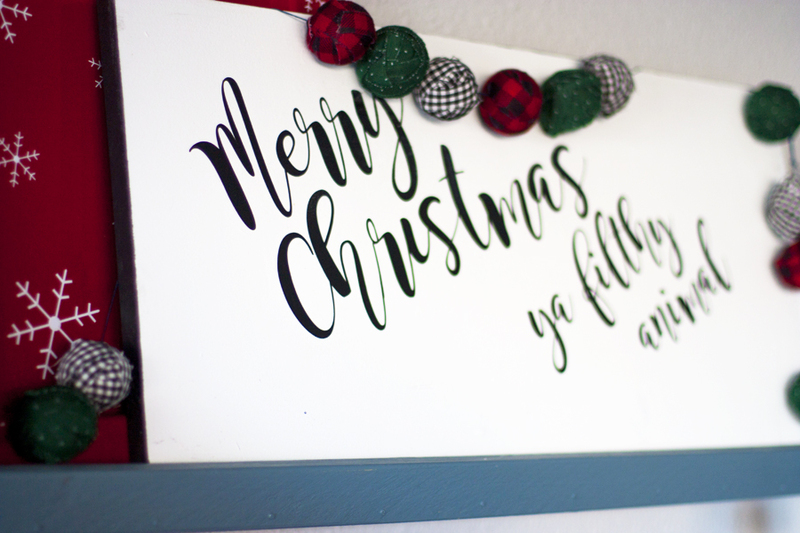 I was challenged with creating a DIY project based on Home Alone, and I ended up making a painted wood sign. I love how it turned out! 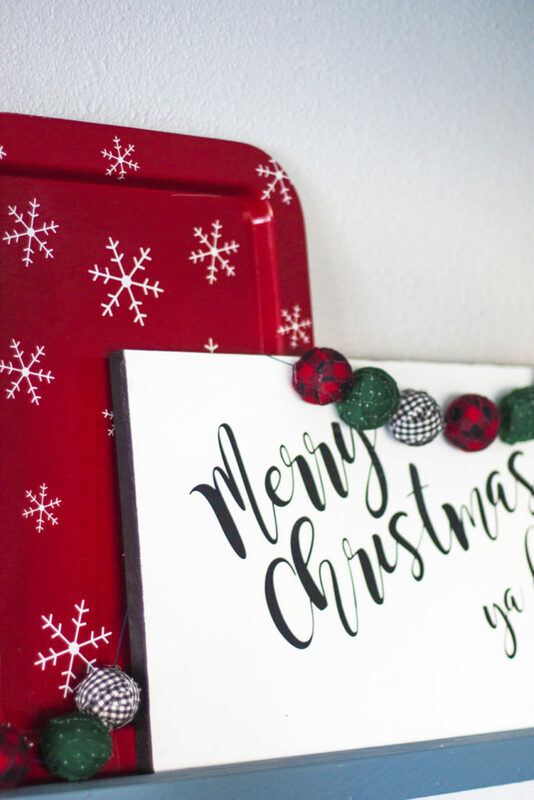 I’m going to share the sign tutorial with you first, but be sure to keep scrolling down to the bottom of this post to find links to 24 other Christmas project and recipe ideas. There’s so much festive inspiration, so you definitely don’t want to miss it all! This post contains affiliate links for your convenience. See my disclosure for more information. 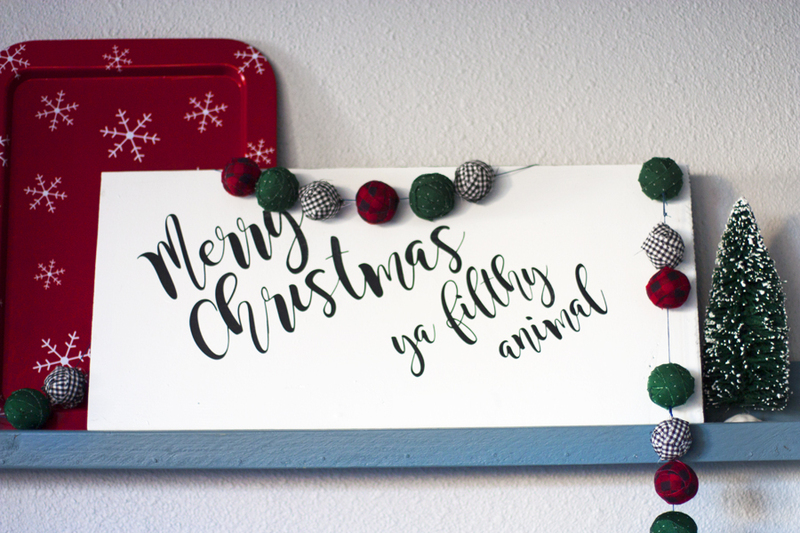 After a lot of brainstorming, I decided to create a project using the saying “Merry Christmas, ‘ya filthy animal” based off of one of the most well known quotes Kevin McCallister said during the Home Alone movies. I’ve been wanting to practice my painted wood sign making skills, and decided this was the perfect project for it. So I st out to make this sign using my trusty crafting sidekick: my Silhouette! First up is sanding! Sand both sides of your board smooth and pay extra attention to the cut ends that may be rough. If you have an electric sander, that’s awesome. If not, this is something that’s manageable to sand by hand. Then use a smaller paint roller to paint the board. I painted the back and edges black and the front white. You an obviously take creative liberty here and use any colors you’d like. Two coats was plenty to get good coverage. While you wait for the paint to dry, you can go ahead and cut out the vinyl lettering. Download the quote file and open it in your Silhouette Studio software. 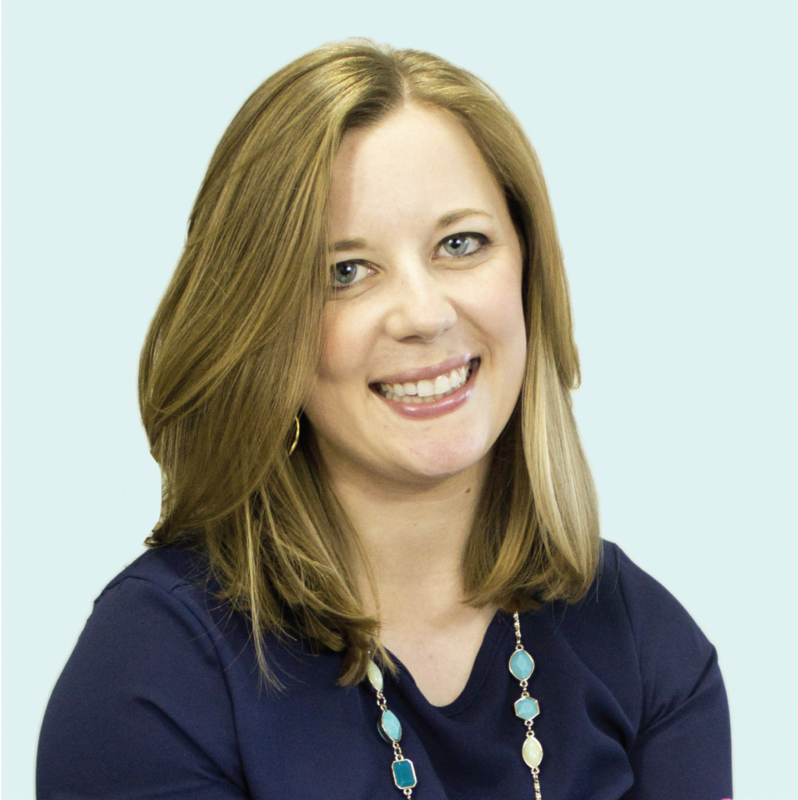 If you are using a different size of board, you’ll want to resize the lettering to fit. 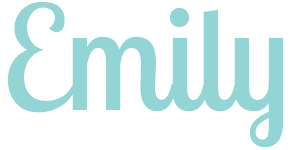 Tip: If you use cursive fonts in your design, click on the letters and choose the “weld” option so your machine will cut the outline of the entire word instead of individual letters. It’s also helpful to select multiple letters and words and choose “group” so they stay together when I move them around on the page. I was working with scraps of vinyl, so I couldn’t fit all of the words on one page. You’ll need to adjust the page size settings according to the size of vinyl you have. If the words don’t fit right, you can move them around or pull half off the page and cut them on a second sheet. Vinyl is really easy to use with the Silhouette, and you don’t need your mat since you can load it straight into the machine (unless you have really small pieces). Adjust the cut settings and change the blade setting accordingly. Hit “send to Silhouette” and let your Silhouette do all the cutting from there! Use your hook tool and scraper to pull off the excess vinyl around your lettering. This will leave you with just your words on the paper backing. 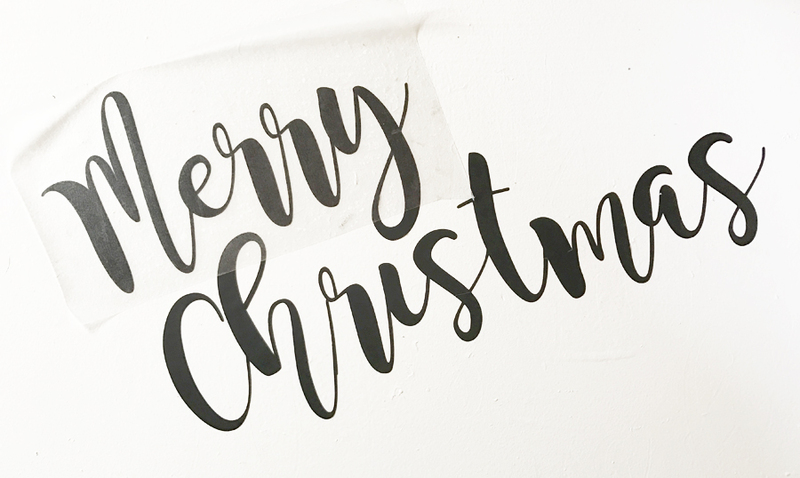 Cut a piece of transfer paper to the size of your design, peel off the backing and lay the sticky side down on top of your vinyl lettering. Use the spatula tool or a credit card to press the transfer tape down firmly. Then slowly peel the transfer paper up so the vinyl words stick to it. Be patient with the vinyl lettering so it doesn’t rip. 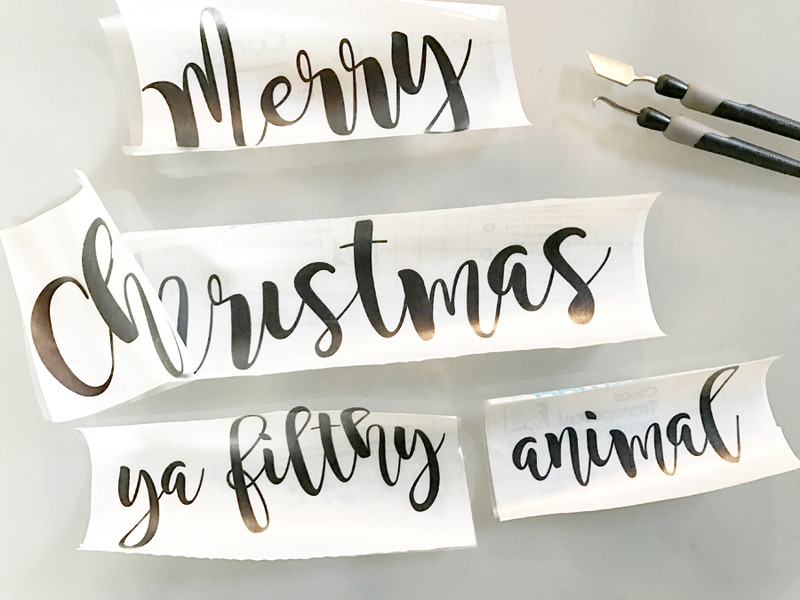 The spatula tool is helpful for pulling up pieces of lettering as you go. I found it best to transfer one word at a time. But if you were able to fit the whole quote design onto one piece of vinyl, it’s great to transfer it all as one piece so you don’t have to worry about aligning the words on the sign. Once your words are transferred and ready to apply to the sign, give them a light dusting of adhesive spray to make sure they stick really well. 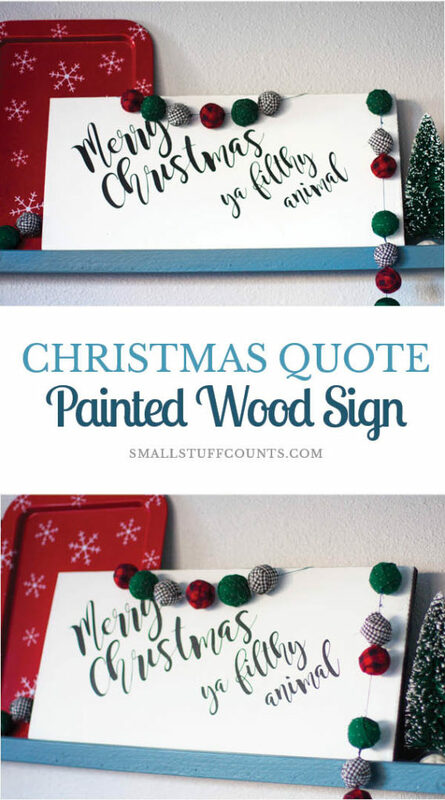 Lay your lettering in place and press it onto the painted wood sign, slowly peeling off the transfer tape as you go. Once the lettering is in place, press everything down firmly and you’re all done! This step is extra nice because there’s nothing that needs to dry so your sign is ready to hang up right away. Doesn’t it look nice? 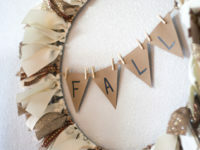 I’m constantly amazed at all of the professional looking crafts and decor you can create with a Silhouette. If you don’t have one, I highly recommend it! It would be an awesome gift to add to your wish list (see my Silhouette gift guide here). The painted wood sign looks so great perched on top of my DIY picture ledge above our couch! I’ll share the full picture ledge all decked out for Christmas very soon! I made these fabric “beads” following the same method I used on the fabric covered DIY ornaments I shared last week. Instead of covering ornaments, I covered some small styrofoam balls and poked a hole through the middles so I could thread them on a piece of yarn. 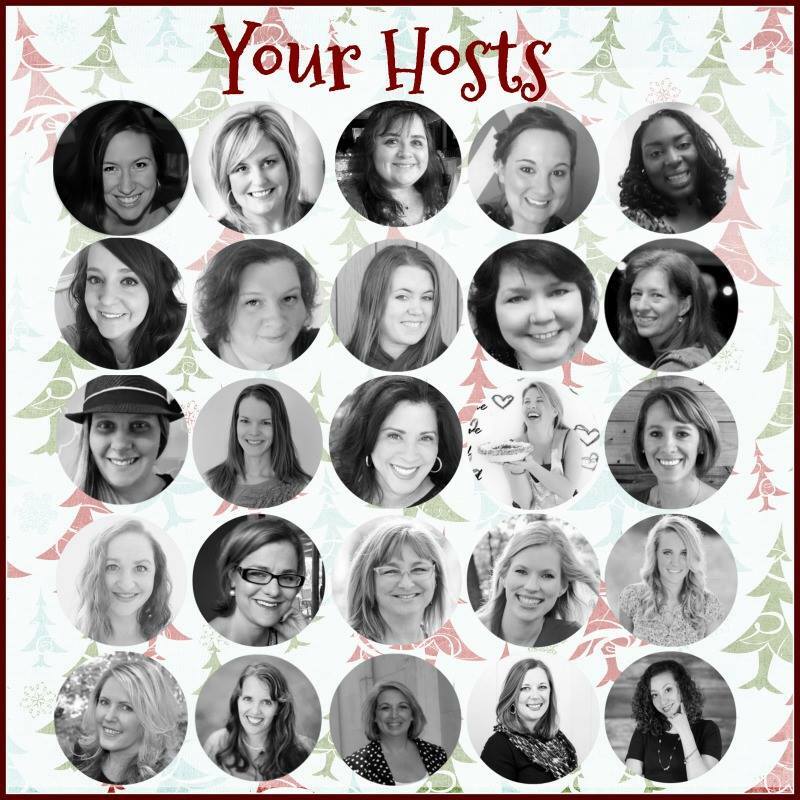 Get in the holiday spirit with all of the other fun Christmas recipes and crafts my blogger friends made! To get started, hop on over to Evey’s Creations to see the Home Alone 2 craft she created. 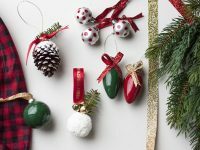 Each blogger will lead you to the next one on the list, so be sure to finish the hop all the way through for all sorts of Christmas movie inspired project ideas! Home Alone holds so many wonderful memories for my Son (now 25) & I! He was so obsessed wth the movie he memorized the entire scene with the pizza guy & snakes. I made him an ornament with this saying. But I love the sign! Merry Christmas! ?♥️? That’s too funny, Michelle! Does he still have the scene memorized? 😉 Merry Christmas! Your sign turned out amazing! 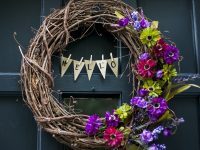 Love your little garland! Home Alone is one of our favourites too! Such a cute idea! I love it! I haven’t seen Home Alone in ages. My brother always loved watching it to get ideas, lol. Thanks so much! I bet your brother got some good prank ideas from Home Alone! What great use of simplicity. I really enjoy the buttons on the sign, they turned out beautifully. Why thank you, Paula! Merry Christmas! Home Alone is definitely one of my top 5 favorite Christmas movies and your sign sums the movie up perfectly. I love it! I love how you styled it too. Me too, Alli! Thanks for visiting! I’m loving your sign!!! 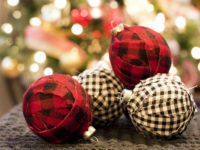 Especially paired with those cute fabric covered ornaments. Love it all. This is so funny! I love this movie and it’s a must in our home every year. Thank you for sharing and love hopping with you. Christmas movies are definitely the best family traditions!